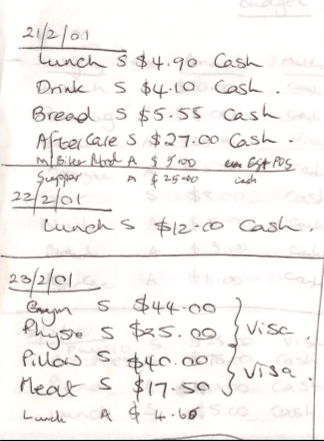 I hate budgeting … so, I’ve only ever tracked my expenses once! That’s why I was so excited a number of years ago (very early on in my Financial Re-birthing Process] to come across John Burley’s ‘No Budget Budget’. … I don’t think I ever got past Day 1 or Day 2, but I’m really glad that I tried his ‘no budget budget’. It’s the ONLY personal budget that I have ever tried (and, don’t even get me started on the subject of business budgeting!). Basically, the process consists of writing down every single dime that you spend (cash, check, credit) for a month. That’s it! 1. Grab a blank sheet of paper and a pen (actually, a little pocket notepad and pencil is ideal … but I kept a folded sheet of paper in my pocket and my wife kept a little notebook and pencil in her purse and every night she would tear the page out that she used and give it to me to add to my sheet). – What we bought (e.g. lunch; drink; bread; newspaper) … we did this for every single purchase! Also, we added a new ‘last day’ of the month, so that we could write in 1/12 of any annual expenses (eg insurance) whether paid for in that month or not. So, we simply kept a log of all of our spending for each day, in exactly the same way that we did for Feb 1 for the whole month … of course, Feb is a dumb month to choose, because it’s the shortest. I can’t find the summary page, but I recall it being something like $1,000 a month that we were spending then.